Hello again to my blog's followers. I couldn't write a new review such a long time due to my private issues and now, I found a chance to write a new one for Charlie Parker with Strings, it is a beautiful romantic jazz album. 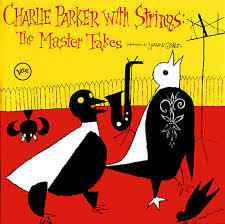 This is definitely one of Charlie Parker's best albums. The vast majority of Bird fans out there seem to really like this album. But there are a few that look at this album as a cop-out on Bird's part because it is not in the fast-paced bebop style for which he is most well-known. Nothing could be further from the truth. Even though Bird is playing with a string section, everything he plays on here is in his own style. He plays a large selection of all standard tunes and plays every one of them with great feeling. The music is pure genius. Here, Bird plays only standards. But when he plays them, all standards look like they were written just for Charlie. It looks like they were waiting to be played by him all along. Like no one else have ever played them before. He comes and goes, he improvises, he returns.. and he never gets too far... and he never gets too literal. My favorite tracks are "Summertime", "Just Friends" , "April in Paris" , "I didn't Know what Time It Was" and "I'm in the Mood for Love". The orchestration is clear and quick to respond (the kind of orchestras we only see in the 50's). If there are records where everything is right... look no further. This is it. It is also worth mentioning that this record was produced by a legend among Jazz producers: Norman Granz (if you are reading this, you probably know him already from other classic Jazz recordings). You can find this album in CD format and also in vinyly format released by Back to Black vinyl.